A recent NAIDOC week collaboration between Kimberley Aboriginal Medical Services (KAMS) and the West Kimberley Women’s Football League saw world renowned street artist Matt Adnate visit Broome to create a very special piece of art for the town. The project reflected the theme for this year’s NAIDOC celebrations ‘Because of her, we can’ by acknowledging the increase of women in footy in the Kimberley and the associated health and Community benefits this has brought to the Region. The artwork, which can be found on the wall of the KAMS building next to the Sun Cinema in Broome, is a beautiful, colourful and startlingly lifelike depiction of two strong, hardworking dedicated young Aboriginal women who through their love of footy are helping to improve the health and community engagement of not only themselves but of their friends, families and peers too. 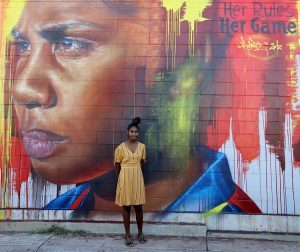 The faces featured in the mural were selected from the Her rules, Her game players and we are very proud that year 9 Broome Senior High School student Sanchez Augustine was one of the two girls chosen. Sanchez is from Looma Community and lives at the Residential College here in Broome during term time in order to attend Broome Senior High school. She is a well-liked and respected member of the Broome Girls Academy who plays for the Cable Beach Football Team. At just 14 years of age she is rated by her coach Mandy as one of the best players on the team. The mural is now a permanent part of our landscape that delivers an empowering message of strength and determination.